Bangladesh has made remarkable progress in reducing poverty, supported by sustained economic growth. Based on the international poverty line of $1.90 per person per day, it reduced poverty from 44.2 percent in 1991 to 13.8 percent in 2016/17. In parallel, life expectancy, literacy rates and per capita food production have increased significantly. Progress was underpinned by 6 percent plus growth over the decade and reaching to 7.3 percent in 2016/2017, according to official estimates. Rapid growth enabled Bangladesh to reach the lower middle-income country status in 2015. In 2018, Bangladesh fulfilled all three eligibility criteria for graduation from the UN’s Least Developed Countries (LDC) list for the first time and is on track for graduation in 2024. I left Bangladesh in 1980. Not too long after I was born. I went back to visit in 1989 and 2004. In relation to 1980, per capita GDP was 1.15x. in 2004 it was 1.6x. In 2016 it was 2.9x. So over the past 14 years there’s been a 2x increase in GDP per capita in Bangladesh! The equivalent figure in the United States is 1.1x. Just an update on the South Asian Genotype Project. It seems Brahmins from Maharashtra are like Brahmins from South India. Brahmins from Gujarat are like Brahmins from North India. 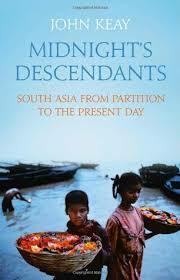 I recently read John Keay’s Midnight’s Descendants: A History of South Asia since Partition. Like his earlier books on the history of India and China, this is a work written by a journalist, not an area specialist (though Keay seems to take a particular interest in South Asia judging by his oeuvre). To be frank I’m not sure if I learned that much…and I don’t know much about South Asian history after 1945. But, it reaffirmed my intuitions that some of the ideologues who bandy extremely high casualty rates are doing a disservice to the real tragedies that have marred the subcontinent over the past century. In any case, I do recommend this book to the 50% of the readers of this weblog who are not South Asian. Note: I don’t have the time or interest to read Guha’s India After Gandhi. Also, my friend Reihan Salam has indicated to me it’s a more tendentious work than most are willing to admit. On of the most annoying tropes in modern intellectual discourse, in particular of the postcolonial variety, is its Eurocentrism. That is, the focus on the Western colonial experience is so strong and unwavering that operationally the rest of history becomes prehistory, a formless period which we are ignorant of, when humans were different in fundamental ways. Empirically this is of course false. Earlier I have mentioned that the Central Asian Iranian polymath, Al-Biruni, had much to say about India. His was one of the earliest extensive anthropologies we have about the subcontinent from the prespective of an outsider. Though Al-Biruni was from a region which had once had a flourishing Buddhist presence, by the 10th century this had faded from historically memory. 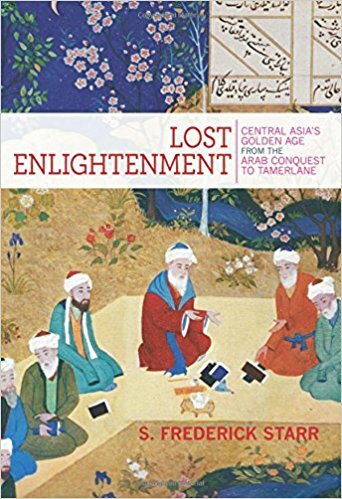 Whereas earlier Islamic scholars from previous centuries allude to the persistence of Buddhists in what is today Central Asia and Afghanistan, by Al-Biruni’s lifetime non-Muslims were in sharp retreat (though in the fastness of area like Chitral paganism persisted for a thousand years). The belief of educated and uneducated people differs in every nation; for the former strive to conceive abstract ideas and to define general principles, while the latter do not pass beyond the apprehension of the senses and are content with derived rules, without caring for details, especially in questions of religion and law, regarding which opinions and interests are divided. With regard to God, the Hindus believe that he is one, eternal, without beginning and end, acting by free will, almighty, all-wise, living, giving life, ruling, and preserving; one who is unique in his sovereignty, beyond all likeness and unlikeness, and neither resembling anything nor having anything resemble him. In order to illustrate this, we shall produce some extracts from the Hindu literature…. If we now pass from the ideas of the educated people among the Hindus to those of the common people, we must first state that they present a great variety. Some of them are simply abominable, but similar errors occur also in other religions. Nay, even in Islam we must decidedly disapprove of the anthropomorphic doctrines, the teachings of the Jabriyya sect, the prohibition of the discussion of religious topics, and such like. Every religious sentence destined for the people at large must be carefully worded, as the following example shows. Some Hindu scholar calls God “a point,” meaning to say thereby that the qualities of bodies do not apply to him. Now some uneducated man reads this and imagines that God is as small as a point, and he does not find out what the word “point” in this sentence was really intended to express. He will not even stop with this offensive comparison, but will describe God as much larger, and will say, “He is twelve fingers long and ten fingers broad.” Further, if an uneducated man hears what we have mentioned, that God comprehends the universe so that nothing is concealed from him, he will at once imagine that this comprehending is effected by means of eyesight; that eyesight is only possible by means of an eye, and that two eyes are better than only one; and in consequence he will describe God as having a thousand eyes, meaning to describe his omniscience. Similar hideous fictions are sometimes met with among the Hindus, especially among those castes who are not allowed to occupy themselves with science, of whom we shall speak hereafter. As the word of confession, “There is no god but God, Mohammed is his prophet,” is the shibboleth of Islam, the Trinity that of Christianity, and the institution of the Sabbath that of Judaism, so metempsychosis is the shibboleth of the Hindu religion. Therefore he who does not believe in it does not belong to them, and is not reckoned as one of them. For they hold that the soul, as long as it has not risen to the highest absolute intelligence, does not comprehend the totality of objects at once. Therefore it must explore all particular beings and examine all the possibilities. The point of this post is not to show that Al-Biruni had a good idea of what “Hinduism” was, though I think if you read it on the whole he isn’t that far removed from how some moderns would characterize it. Rather, it is to show that the distinctiveness of Indian religious thought was noticed long before Europeans arrived to create a specific categorization system which we utilize today. The details of the system might deviate from Al-Biruni, or Adi Shankara, but in its broad outlines it’s describing the same thing. 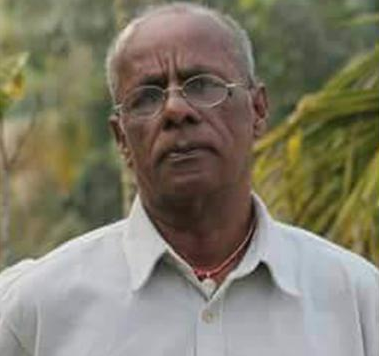 Shahzahan Bachchu was known locally and within the secular Bangladeshi movement as an outspoken, sometimes fiery activist for secularism. He printed poetry and books related to humanism and freethought via his publishing house Bishaka Prakashani (Star Publishers). He was also a political activist, serving as former general secretary of Munshiganj district unit of the Communist Party. He was reportedly shot and killed this evening near his village home at Kakaldi in Munshiganj district near the capital Dhaka. The fool hath said in his heart, There is a God. I don’t have too much time right now. So a quick data post. 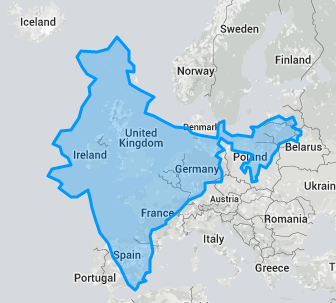 The map above shows India’s scale in relation to Europe. Please notice the small genetic difference between Britain/Spain/Poland. Compare to Gujrati vs. Sindhi, let alone Gujrati vs. Telegu. Genetically Sindhis occupy a place between South Indians and Iranians. Some Gujaratis are nearly where Sindhis are, but many are far more shifted toward South Indians. The Fst display masks this since it aggregates populations. 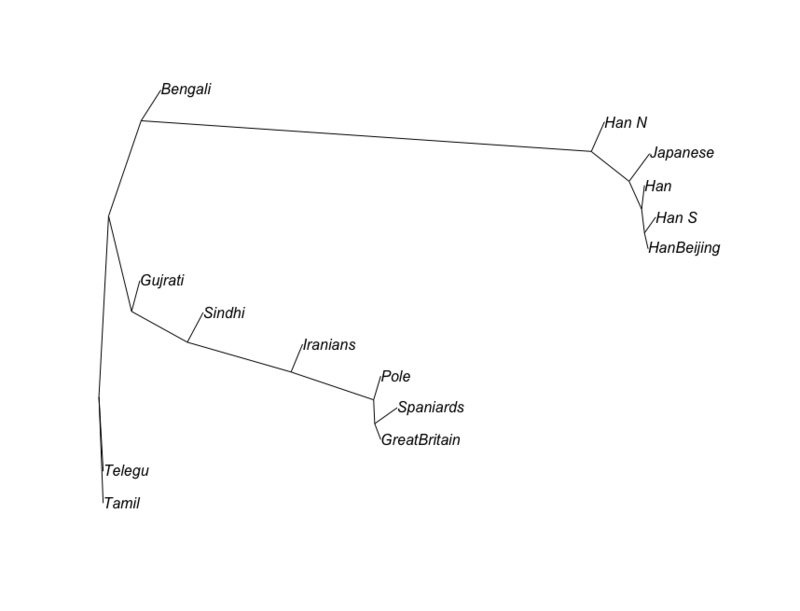 Treemix shows the relationships and their scale. South Asians have a lot of drift between them. Some of you are probably bored by this post and wonder about it’s practical implication. If so, keep on paging down (or up). 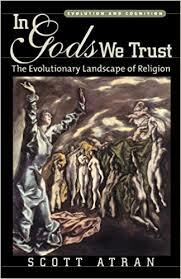 A major influence on my thinking about human social phenomenon is Scott Atran’s In Gods We Trust: The Evolutionary Landscape of Religion. Atran, along with other scholars such as Dan Sperber and younger researchers such as Harvey Whitehouse, work within a “naturalistic” paradigm, as opposed to the more interpretative framework currently ascendant within American anthropology. The interpretive framework emphasizes “thick description,” and avoids generalities (unless they are convenient ones! ), as well as exhibiting a suspicion of synthesis with the natural sciences. Ways of thinking such as post-colonialism are part of the umbrella of paradigms which are consonant with interpretive anthropology’s premises. Both naturalistic and interpretive frameworks are useful. But I believe in modern discourse the latter is given almost monopolistic power to adjudicate on factual matters, even though in other contexts those who engage in interpretation are wont to say that facts are fictions! Let’s start with the idea that the idea of religion qua religion is Protestant, Christian, or Abrahamic. I’ve seen all three flavors of the argument using a narrow definition of religion. It’s hard to deny that Christianity, and often in particular Protestantism, have resulted in a reorganization and reimagining of non-Christian religions. For example, the “confessionalization” of South Korea after World War II, and the transformation of Won Buddhism into an institution which resembles Protestantism would be a case in point. Or the emergence of Arya Samaj in the 19th century, and its relationship to the stimulative effect of evangelical Protestantism. It is hard to deny confessional Protestantism is a very particular form of religion, and a clear and distinct one. The emphasis on individual volition in this view of religion makes it such that identity is clear and distinct through adherence to a precise formula and community. Practitioners are self-conscious in their identity. They come to it, it is not given to them. But is it fair to say that religion by necessity must follow the outlines of confessional Protestantism? Or that it has to be a congregational faith with exclusive boundaries, as the Abrahamic faiths tend to be? Not necessarily. A Ju/’hoansi tribesman in the Kalahari does not follow any of the organized world religions. He or she surely does not have the word for religion in their language, unless he or she is in extensive contact with missionaries. But the Ju/’hoansi have a rich supernatural world in which they believe, and which is seamlessly woven into their lives. Do the Ju/’hoansi have a religion or not? If you asked them they might not know what you are talking about. The Ju/’hoansi lack many of the institutions which modern societies have, so they don’t need all the labels of modern societies. Do the Ju/’hoansi have “daycare”? Again, they would look at you in a very confused manner. But the do have Ju/’hoansi some alloparenting. It’s just something implicit, tacit, and taken for granted. It might not be labelled daycare, but that’s what it is. Functionally they have daycare, even it’s not institutionalized. To bring it back to the central focus of this weblog, there has been some assertion that Hinduism as such was invented/defined by the British. That Hinduism as a coherent ideology is a very distinct and novel thing from the welter of beliefs and practiced of Indians more generally. It is clear there is some truth in this. The Hinduism of a Brahmin expositor of Sanatana Dharma is distinct from the local spirituality of a adivasi group, and both differ from something like Gaudiya Vaishnavism. But the reality is that Hinduism is not particularly unique. American Presbyterians exhibit self-conscious identity and adherence to elite-mediated belief and practice. This sort of individualistic confessional Christianity is arguably the apotheosis of a modernist conception of religion. But this is a relatively new development in the West among Christians. The vast majority of the European peasantry did not exhibit this sort of Christian self-consciousness before the later medieval centuries, and much of it did not become self-conscious until after the Reformation period. This is one reason that some Reformed Protestants argue that Europe was not Christianized until after the Reformation. Peasants may have had a sense that they were Christians, and others were heathens, but the full liturgy and deep catechism were not necessarily a part of their lives (in contrast to the elite). And yet it seems ridiculous to assert in the context of the Crusades, the rise of Gothic cathedrals, and the conversion of Northern and Eastern Europe by missionaries, that Europe was not Christian before the late medieval period. Individual Europeans may not have been self-conscious confessional Christians, but everyone around them was at least nominally a Christian. Additionally, the Christian Church, whether West or East, saw itself as bringing salvation to everyone within the society, high or low, poor or rich, and devout or ignorant. 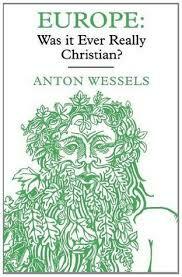 Many Europeans were not Christian in the individual way modern evangelical Protestants would understand, but European civilization was Christian. I think this is the best way to understand what Hinduism was, and what it became. 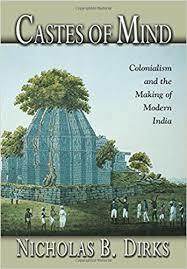 Indian civilization was long seen to be distinct by the ancients. It was not a random and disparate collection of peoples, but a civilization with various centers, and jostling competition between aspirant elites. It is well known in the pre-modern period “Hindu” seems to have bracketed people who lived in India. From the Muslim perspective all non-Muslims who lived in the subcontinent. It was a geographical designation more than a religious one as such. But it is clear that already by the time of the arrival of Muslims in the Sindh in the 8th century, and definitely by the era when Al-Biruni wrote his well known ethnography of South Asia around 1000 AD, that Indian religion had taken on some distinctive forms and outlines, even if it was not self-consciously termed Hinduism. It is clear because outsiders describe normative Indian religious practices and beliefs that we would recognize today (e.g., reincarnation). There are two other elements to this broader issue. First, it curious that the British had to define Hinduism, when it seems Muslims had been doing so for the whole period after the initial incursions. Al-Biruni made the most thorough early attempt, and his writings on India would make an Orientalist proud. And I say that not as a dismissal, but a description. Al-Biruni seemed rather clear-eyed that Indian hostility to Muslim was due to the predatory character of the warlords who also patronized his scholarship. The focus on the British reflects the recency-bias in post-colonial studies, where the only colonialism and conquest of interest is tht which is executed by Europeans. 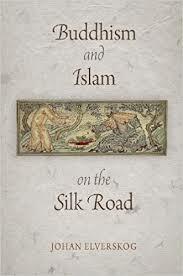 Additionally, I am convinced by the arguments in Buddhism and Islam on the Silk Road, Lost Enlightenment: Central Asia’s Golden Age from the Arab Conquest to Tamerlane, and Warriors of the Cloisters: The Central Asian Origins of Science in the Medieval World, that Turanian Buddhism was essential and instrumental in shaping Islam as we understand it from the Abbassid period onward (in particular, the emergence of madrassa and the hadith traditions). Though Turanian Buddhism is clearly not Hindu, connections to India to the south and China to the east were part of a broader “Buddhist international” which flourished in the 4th to 7th century. This is not to deny the distinctiveness of the Islam Al-Biruni used as a contrast to Indian religious thought. But, by his life Central Asian Buddhism was extirpated, and he would not have been able to see the influence of that Indian-influenced tradition on Islam because it had become thoroughly integrated. Second, Indian religious civilization was successfully exported to the east so it was not constitutively associated with being Indian. The Balinese of Indonesia and the Cham of Vietnam are recognizably Hindu. It would be curious to tell them that the British defined Hinduism in the early modern period…when they were practicing Hinduism 1,000 years ago. The Ankgor temple complex was built in the 12th century, when Hinduism was Cambodia’s dominant elite religion. Finally, an addendum to my post on caste and genetics. I read Castes of Mind many years ago. 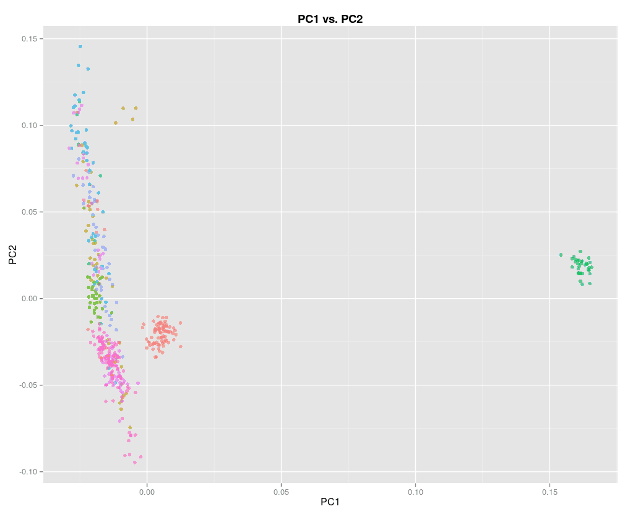 I think many of the arguments in that book aren’t necessarily invalidated by the genetic data. But, we need to think hard about whether we really expected the genetic data given the thesis that British colonialism was highly determinative in shaping the hierarchy and structure of South Asian society. In fact, the genetic data makes it clear that most South Asian communities have been distinct and endogamous for several thousand years. 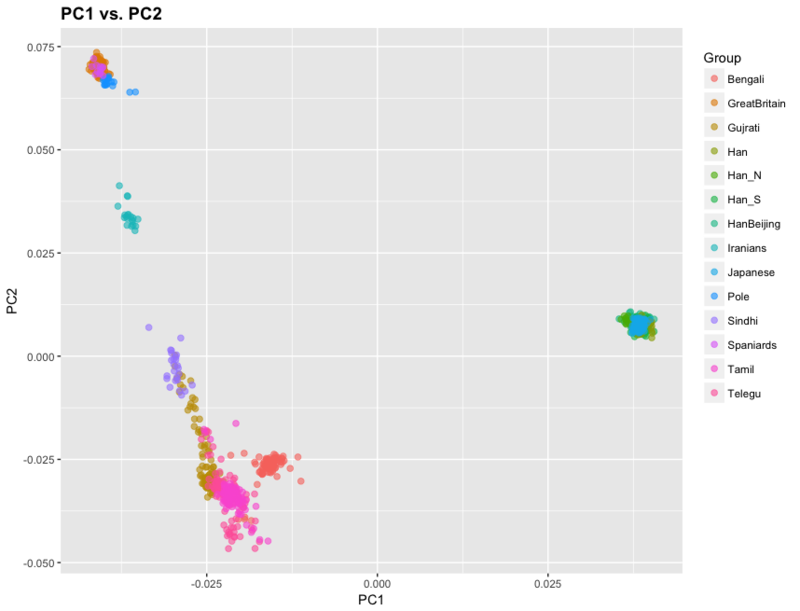 That the genetic differences between castes groupings and jati within regions are closer to what you could expect of from differences between antipodes of a continent. 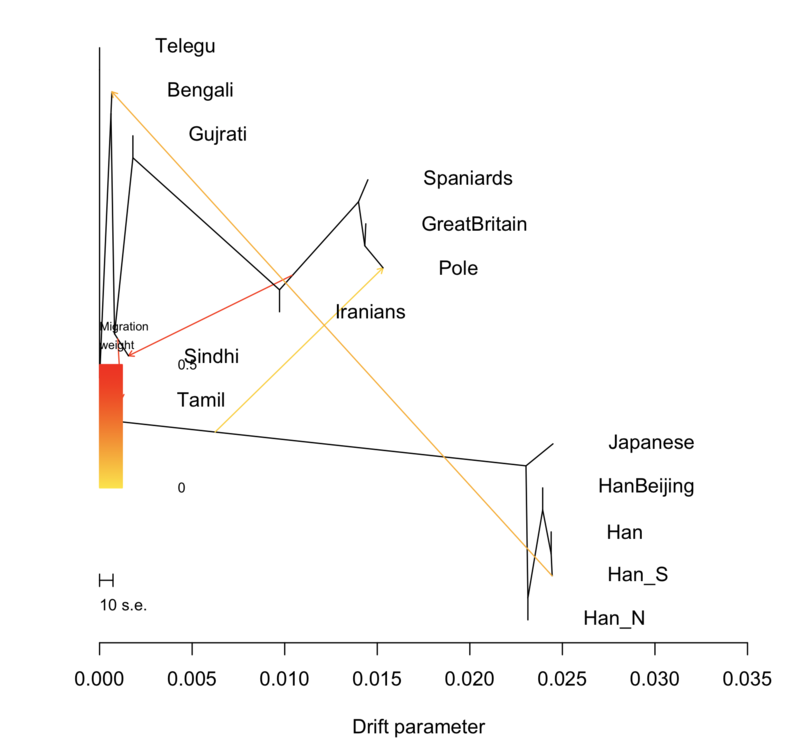 And, within a given region ancestry which is closer to West/Central Eurasian tends to be enriched in groups “higher” up the modern caste ladder, across the subcontinent (at least if there is a correlation). Additionally, this is not well known, but the genetic structure seems to exist even if you remove Indo-Aryans from the picture. Groups such as the Reddys and Nadars in South India who do not have any northern/western affinity at all are still genetically quite distinct from adivasis and scheduled castes in the local region. They also tend to have more West/Central Eurasian ancestry than adivasis and scheduled castes in the local region.